Every Christmas Eve, Italian-American families gather around the table to partake in the Feast of the Seven Fishes, a distinctly Italian-American tradition of unclear origins. 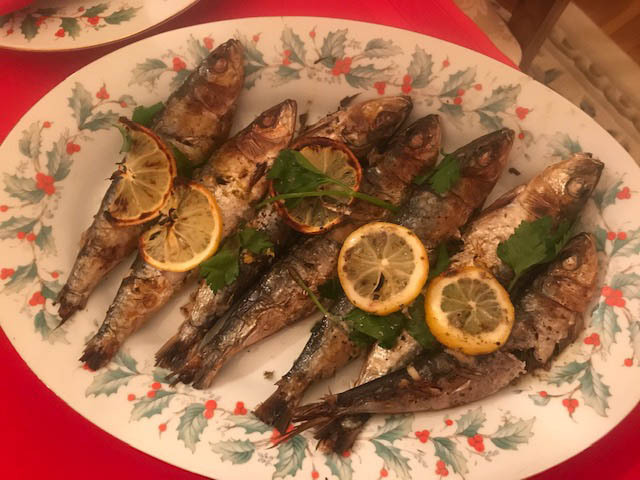 Mention of the feast to native Italians will result in a blank stare (like asking for lemon peel in your espresso)—while they may dine on fish in Southern Italy on Christmas Eve, they likely don’t have a specific number in mind. What is the significance of the number seven? There’s no definitive answer—perhaps it’s the seven sacraments, the seven deadly sins, or the seven days of creation. 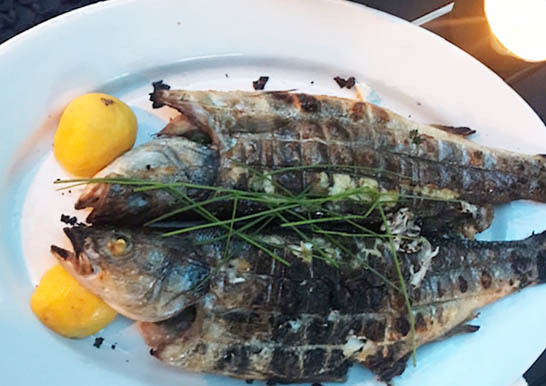 Since some dishes incorporate multiple fishes, we usually wind up with more than seven, and there are families who insist on ten (for the commandments or the stations of the cross), and even twelve (for the apostles) or thirteen (the apostles plus Jesus). One thing that the Italian-Americans and their Southern Italian brethren have in common is the lack of meat on their Christmas Eve menu—believe it or not, this feast is supposed to be a partial fast. Since early childhood, Christmas Eve has been my favorite part of the holiday. Presents, Santa, and tinsel were all distractions in my book. Grandma Del did the bulk of the cooking, arguing with my mom along the way, in typical Campanian fashion. As my grandmother got older, my mom took over, and I began to assist. Eventually the torch, well, wooden spoon, was passed along to me. My mom still helps and continues the tradition of arguing. Grandma’s house was passed on to my mother, and we still have Christmas Eve in the same New Jersey house I’ve had it in for nearly all of my 36 Christmas Eves thus far (except for my honeymoon in 2014 when I begrudgingly dined on mahi mahi and ahi tuna in Hawaii), cooking in the same kitchen that my great-grandmother, Nanny, grandmother, and mother cooked in. I can’t help but think that both my grandmother and great-grandmother would be proud, even if they disagree with some of my methods and ingredient choices. They didn’t concern themselves with gourmet technique and sustainability, and the menu has evolved from the days when Nanny was in charge—it was the fried smelts, the baccala, and the baked eel (just like in the old country). In those days, after dinner, I imagine that the women cleaned up, the children opened presents, and the men sat around sipping their Marie Brizard and smoking their Di Nobilis before heading to midnight mass. Times certainly have changed, but the spirit of the holiday remains. Religious symbolism aside, the number of fishes eaten isn’t all that important. It’s better to have three superlative dishes than seven lackluster ones. Quality over quantity is the baseline of Italian cuisine, and simplicity in preparation allows the fish speak for itself— great Italian cooking is about restraint. Don’t be intimidated by cooking fish—if you respect the ingredients and purchase the freshest and best fish you can find, you and your guests will be rewarded. While the dishes listed below are fairly straightforward in both contents and execution, it makes sense to give each recipe a trial run before debuting on a holiday if it’s the first time you will be making it. When possible, buy local, seasonal, sustainable seafood – wild or responsibly-farmed. (There are plenty of options out there – stay up-to-date with SeafoodWatch. Fish should smell like the sea, not “fishy” and eyes should be clear, not cloudy. Consult with your trusted fishmonger about the freshest fish available that day and remember that, as the sign at Randazzo’s Clam Bar in Sheepshead Bay says, “fresh seafood isn’t cheap; cheap seafood isn’t fresh.) While not local, the azure waters of the Mediterranean supply some of the world’s most delectable seafood. The Del Giudice/Pinizzotto clan courses out the meal, but some families prefer a more casual buffet setup. After discovering on a summer holiday to the Algarve in 2015 that Portugal had some of the finest fish I had ever sampled, I had the (not so) bright idea to wake up nice and early on December 23rd to take a ride, with a borrowed cooler in my trunk, to Popular Fish Market, a wildly “popular” Portuguese seafood market in the Ironbound section of Newark. Apparently, everyone else in the tri-state area had the same idea. After taking a number and having coffee and Portuguese pastries at the café next door, I returned to Popular to find that there was still a multi-hour wait. Defeated, I headed down the turnpike to the rain-slicked Goethals Bridge and Verrazano back to Brooklyn to Fairway, which proved to be a one-stop shop for most needs. A few other stops were made, and my shopping list was complete. The ingredients depicted in the recipes below are generally easy to find at any local fish market or gourmet grocer. In the Brownstone Brooklyn area, aside from Fairway, I suggest Fish Tales in Cobble Hill, Mermaid’s Garden in Prospect Heights, Whole Foods in Gowanus, and Union Market (various locations). In Manhattan, the answer begins and ends with Eataly and Pescatore Seafood Co. in Grand Central Terminal, but if the crowds are unbearable, try Citarella, Fairway, and Whole Foods which offer a number of locations. It may take several different stores to complete your shopping list, so plan accordingly—that’s part of the fun. If I ever find myself with more time and patience, I will make the pilgrimage to Arthur Avenue in the Bronx to Cosenza’s Fish Market and Randazzo’s Seafood (along with numerous other specialty shops and bakeries). 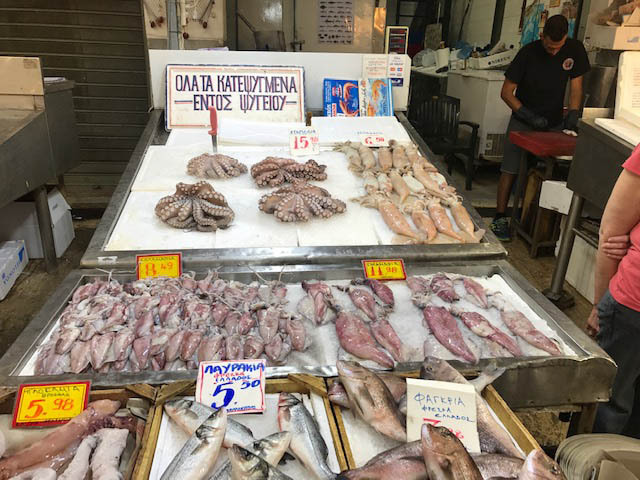 Deeper into Brooklyn in neighborhoods like Bay Ridge, Bensonhurst, and Dyker Heights, there are a number of independent local fish markets, and Astoria is home to several Greek seafood markets. Calling ahead ensures that they have your ingredients in stock and will give you the opportunity to make special orders. Unlike Thanksgiving and Christmas Day, you’ll want to do your shopping either the morning of or the day before. Aside from fish, your shopping list will consist of basic pantry staples that may already have on hand: extra virgin olive oil; garlic (whole bulbs, not pre-peeled or minced); parsley; lemons; capers (salt-packed); butter; red pepper flakes (pepperoncini); red wine vinegar; dry white wine to cook with (NOT cooking wine) and to drink. A note about cooking wine: they say not to cook with a wine you wouldn’t drink, which is nonsense. As long as the wine doesn’t have too much sugar, it’s fine. Just avoid the cooking wine you see on the supermarket shelves and that travesty called “wine product” (which should be illegal) from the corner bodega. Obviously, white wine pairs best with any seafood-centric menu—I prefer minerally whites such as Vermentino, Sancerre, dry Gewürztraminer Riesling, or Grüner Veltliner, and effervescent Vinho Verde from Portugal. Christmas Eve is also a great excuse to drink rosé in the winter. Everyone has that aunt who will only drink Pinot Grigio, so you may as well get a bottle or two of that for her. Lighter reds like Pinot Noir, Beaujolais, and Gamay served slightly chilled can also be paired with richer fishes such as tuna and swordfish or with tomato-based sauces. Save the salumi and cheese assortment for tomorrow; the best way to begin Christmas Eve is with lighter fare, such as mixed olives (Castelvetrano and Sicilian oil cured are my personal favorites), marinated artichoke hearts, marinated mushrooms, giardiniera (pickled vegetables), marinated white anchovies, roasted red peppers, sundried tomatoes (or, better yet, semi-dried cherry tomatoes), and eggplant caponata. Jarred caponata can be delicious, but homemade is superior and can (and should) be prepared in advance. Enjoy with an Aperol Spritz, Campari and soda, or a glass of Prosecco. 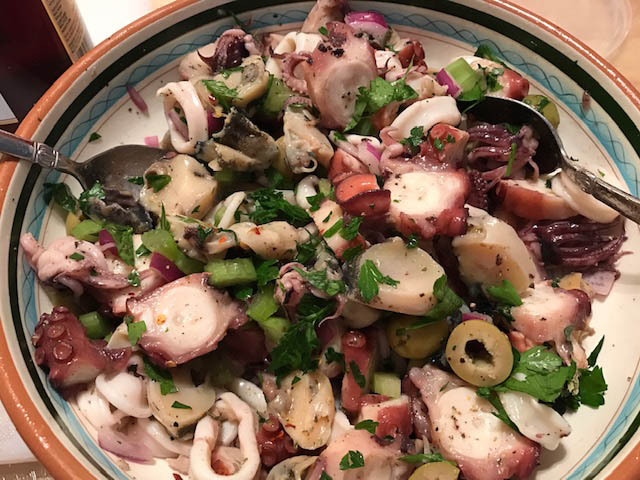 This seafood salad is a classic—a delightful mélange of polpo (octopus), calamari (squid), and scungilli (conch or whelks) dressed simply in olive oil, red wine vinegar, fresh lemon juice, a few red pepper flakes for good measure, along with sea salt and a grind of black pepper. I also garnish with capers, diced red onion, diced celery, and fresh parsley. For the polpo, purchase a whole octopus (Octopus is actually better to purchase frozen) and simmer until tender for about an hour in salted water with peppercorns, bay leaves, a teaspoon of white vinegar, and a wine cork, which allegedly aids in tenderizing. (There’s also the Greek-fisherman tenderization method of taking your pent-up holiday aggression out on the poor cephalopod by banging it against a rock for a few hours. To save time and energy, many stores such as Whole Foods in Gowanus offer cooked octopus at the fish counter.) When the octopus is fork-tender, let cool, then slice into 1-inch chunks. Poach or boil the calamari for about 2 minutes, separate the tentacles and cut the bodies into ¼ inch rings. Scungilli are usually sold pre-cooked and just need to be removed from their shells and rinsed, patted dry, then sliced thinly. (If you can’t locate fresh scungilli, try! Fairway or any Italian seafood market should carry it, especially around the holidays; otherwise, you can use the ubiquitous La Monica can—just be sure to drain, rinse, and dry it well.) Assemble the salad a few hours ahead of time to allow the flavors to marry. A staple in Mediterranean diets, there’s no real recipe for grilled sardines. Have your fish monger scale the sardines, leaving the heads and tails intact. Keep on ice until they’re ready to cook. Dry thoroughly with paper towels, sprinkle with a pinch salt, heat a charcoal or gas grill and barbecue for about four-five minutes on each side until the skin is crispy and well-charred and the meat is cooked through. Charcoal (or wood) will yield the most flavorful results, but if it’s too cold/inconvenient to grill outdoors, five minutes on each side in the broiler on high will do the trick. Since this is an oily fish, it’s better to slightly overcook than undercook. To serve, grate lemon zest on top (to counteract the oiliness) and garnish with charred lemon slices and parsley (or prepare a gremolata to spread on top). Smaller sardines can be eaten whole, bones and all, but I prefer medium-size for grilling and broiling. Plan for about 2-3 per person, depending on the size—about half of your guests will devour these, while the others will politely pass. More for the rest of us. Serve warm or at room temperature. If fresh anchovies look better at market, buy them instead. A crowd-pleaser, white clam sauce is essential for any Italian seafood feast. Many people use linguini, but I prefer spaghetti, as the sauce better clings to it. Bronze-cut is best, and dry pasta rather than fresh is easier to work with. Littleneck clams are my personal choice, but you can use cockles, more popular in coastal Italy, if you’d prefer (just buy more of them). Cherrystones can be a bit tough, but there are people who insist on using them. (One of the funniest Sopranos scenes was when Phil Leotardo’s wife, in the midst of him having a heart attack, was asking him whether he wanted Littlenecks or Cherrystones on Christmas Eve since the previous year he had complained that the Cherrystones were too tough. So typical.) 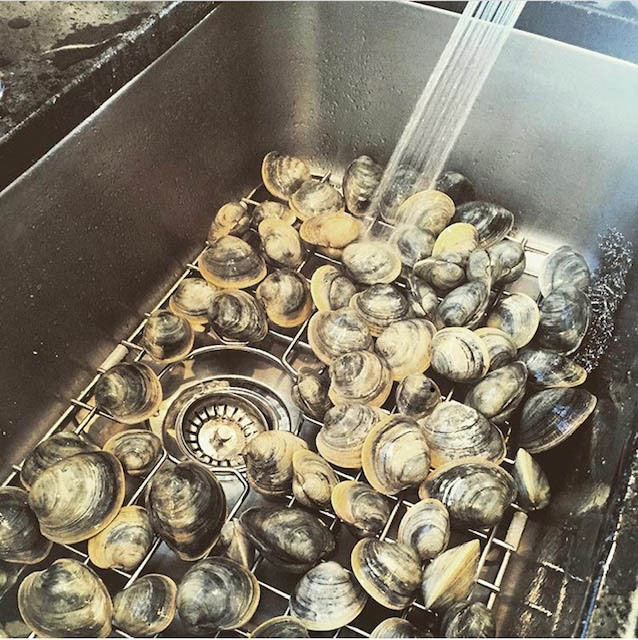 Rinse the clams and purge the clams overnight in a colander in the refrigerator or in the garage with a damp cloth. Cook the pasta in water with about half as much salt as most recipes call for (clams are naturally saline), coat a deep and wide heavy-bottomed sauté pan with olive oil, and lightly fry some chopped garlic until golden brown. 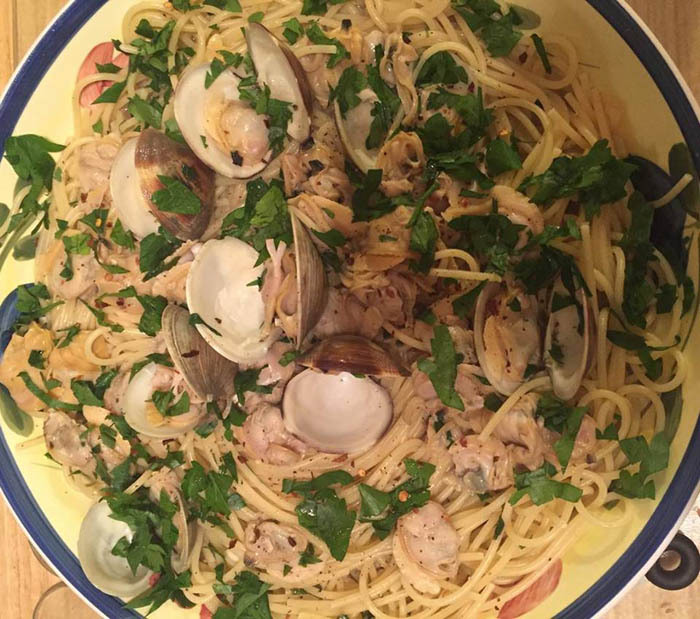 Add the clams and a cup of dry white wine—no need for additional clam juice; fresh clams produce adequate “liquor” as they open— along with some salt, pepper, and red pepper flakes to taste, set to medium heat, cover the pan, wait for them to begin popping open; remove each clam as it opens and transfer to a bowl, pulling most of the clams out of the shells and discarding the shells (keep a few in the shells for garnish). Tedious, yes, but you want to ensure that the clams aren’t rubbery, and since clams have a tendency to be stubborn and selfish, they don’t like to all open at once, especially when the pan is somewhat crowded. Once the pasta is just short of al dente (it will finish cooking in the pan), transfer to the pan, add the clam meat and any juices formed from the shells back to the pasta and stir until all the noodles are coated even, and toss a knob of butter along with a splash of pasta water, continuously stirring until all the noodles are coated evenly. To finish, add torn parsley, a drizzle of olive oil, a few more chili flakes, and some fresh ground black pepper, and serve in shallow bowls alongside bread for sopping up the flavorful sauce. Plan for about 6 clams and 3-4 ounces of pasta per person. 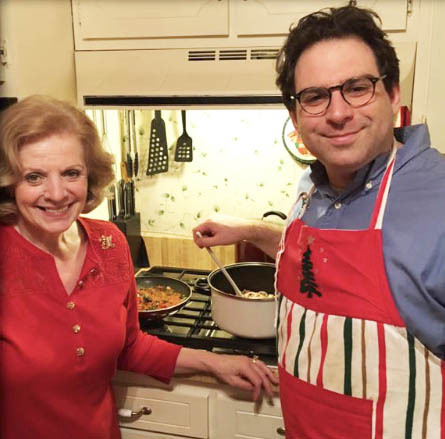 The annual disagreement I have with my mother is the amount of liquid the sauce should yield—she prefers soupier, while I like the pasta itself to take on the briny flavor. Neither of us are wrong; on Christmas Eve, I meet her somewhere in the middle. Another point of contention is my use of butter, which I like to stir in at the very end—my mother grandmother, and great grandmother didn’t use butter. She also likes to cook the parsley in the sauce, but to me, fresh parsley brightens the dish in both flavor and appearance. Please resist the urge to grate cheese on top—not only does it compete with shellfish for flavor, it’s also not good for digestion (per every Italian grandmother). 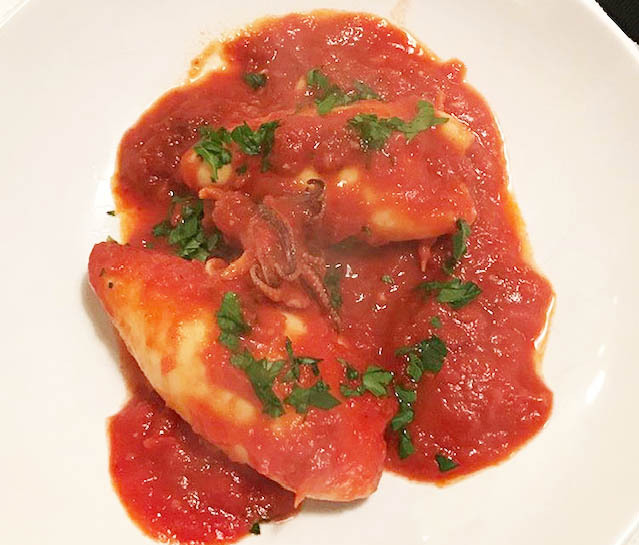 This recipe can be made with a variety of firm, flaky white fish such as striped bass, black bass, branzino, swordfish, monkfish, halibut, red snapper, or cod. Again, freshness matters more than the type of fish itself. 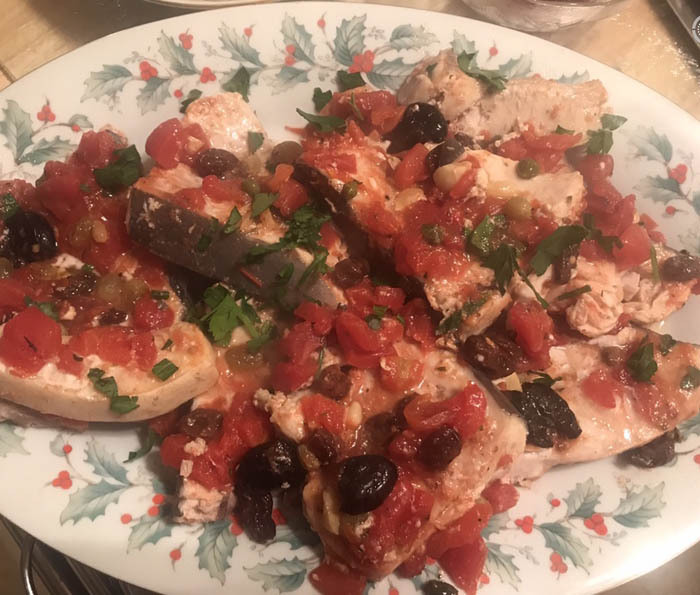 The filets are baked in a 400-degree oven in a puttanesca-like sauce of diced tomatoes, capers, olives, garlic, and anchovy paste. Prepare the sauce ahead of time and spoon it conservatively on top of the fish before baking. The sauce shouldn’t be the focal point; it’s more of a condiment, allowing for the fish to take center stage. Bake the fish for about 10-15 minutes and serve on a platter or on individual plates. As an alternative, agrodolce (Sicilian sweet & sour sauce) is an elegant accompaniment, to pan-seared fish, tuna and swordfish in particular, consisting of a complex, viscous sauce of red wine, white balsamic vinegar, shallots, golden raisins, and a garnish of fennel fronds. The agrodolce can be made ahead of time. Quarter the shallots and cook in olive oil and butter until soft, add a cup of red wine, a cup of white balsamic vinegar, a cup of water, some toasted pine nuts, and ¼ cup of raisins and cook over medium heat until the thick and syrupy, about 30 minutes. Sear the fish in a non-stick pan about 4 minutes per side and spoon the sauce over the fish and serve. One 4-ounce filet or steak per person. More calamari? There are many ways to stuff a squid—be it with lump crab meat, bread crumbs, currants & pine nuts, or even sausage or pancetta. 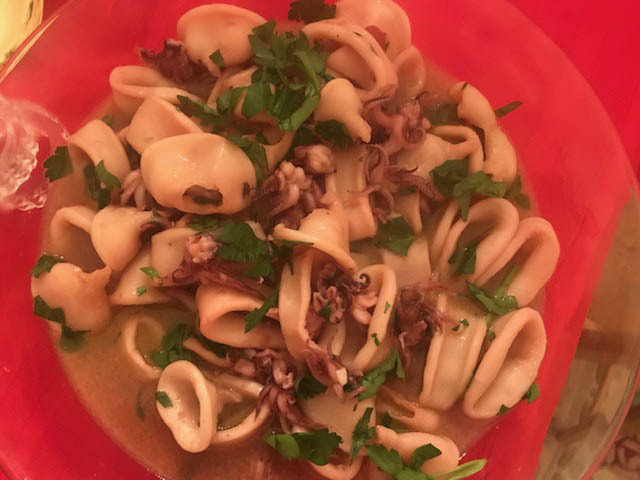 This recipe is an adaptation from Bay Ridge’s own Camille Orrichio Loccisano (former owner of the aptly-named Casa Calamari) that I found in the New York Times several years back, which is a mixture of finely diced shrimp and squid tentacles and pulverized black pepper taralli (in lieu of bread crumbs) stuffed into whole calamari tubes like plump dumplings from the sea, and slow-cooked in a rich tomato sauce until the calamari melt in your mouth. Sautee the shrimp (rock shrimp work well, but any small shrimp will do) and chopped tentacles (leave a few tentacles intact to cook in the sauce) with garlic and yellow onion in olive oil and butter until browned and deglaze the pan with white wine, vermouth, and loosen with seafood stock if need be. When the shrimp begin to turn pink and the liquid has mostly evaporated, remove from the heat. Once cooled, add to a mixing bowl with the “bread crumbs” to form a loose paste (the stuffing). Stuff each squid body with the mixture using a small spoon or piping bag and secure the closure with toothpicks. Meanwhile, prepare a basic tomato sauce by frying thin slices of garlic in a large Dutch oven with olive oil and adding a 28-ounce can or two of whole peeled San Marzano tomatoes (crushed by hand or through a mill), a tablespoon of tomato paste, a pinch of Sicilian or Greek oregano, and a few basil leaves. The sauce can be made well in advance—do it now while you’re thinking about it and freeze it. Once the sauce begins to boil, lower the heat, add the stuffed squid and excess tentacles and simmer for 45 minutes to an hour. (You can also place the pot in the oven at about 300 if you need space on your stovetop.) When the calamari are tender, garnish with a fresh basil and parsley and arrange on a platter or in individual dishes. Plan for 1-2 per person depending on size. Succulent, savory, and peppery, even though your guests will be stuffed to the gills by now, they won’t be able to resist these. If the feast continued for several days, I would love for my menu to include pasta con le sarde, mussels fra diavolo, whole branzino or dorado, cuttlefish or squid ink risotto, seared sea scallops, and some form of baccala, the latter of which would sadly go uneaten by most guests. Serve sides and salads and vegetables in between courses or as an accompaniment to or after the secondi. These dishes are not an afterthought in our household, and they are as enjoyed every bit as much as the fish and shellfish that precede them. Artichokes have been a family favorite for my entire life. For this meal, we generally use baby artichokes, but choose whichever look best at market. Just steam until the leaves begin to fall off and enjoy with a drizzle of olive oil, a squeeze of lemon, and a pinch of sea salt or with fresh mint and chilies. 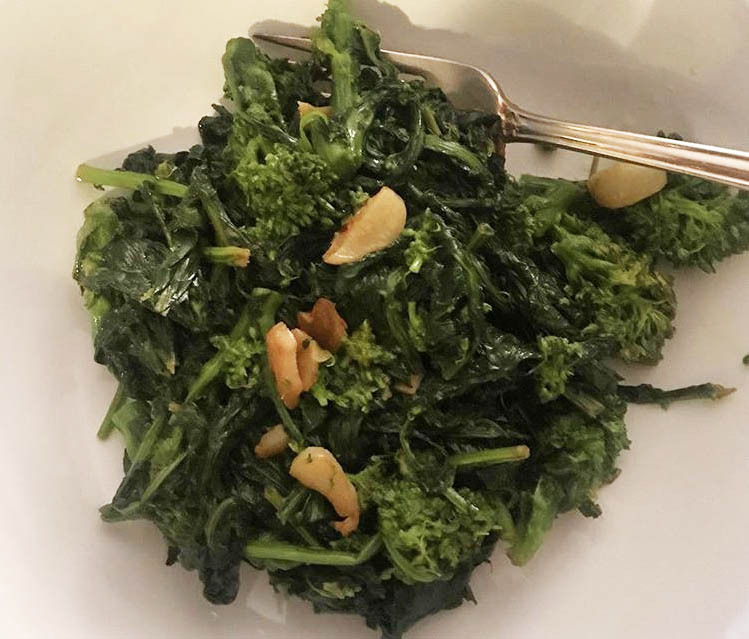 No Italian meal is complete without a side of perfectly overcooked broccoli rabe or ‘scarole in garlic and oil in my book. Prepare in advance and reheat (it’s actually better that way). You can also use dandelion greens or mustard greens, and if you are averse to bitter greens, either blanche them to remove the bitterness or substitute with fresh spinach. This colorful and refreshing early-winter salad is comprised of shaved fennel, blood orange segments, and cured olives, drizzled with olive oil, and garnished with fennel fronds. For best results, use a mandoline, but be careful. A trip to the emergency room is the last thing you need today (and I know from experience). You can’t go wrong with endive, radicchio, and arugula in a light vinaigrette dressing. 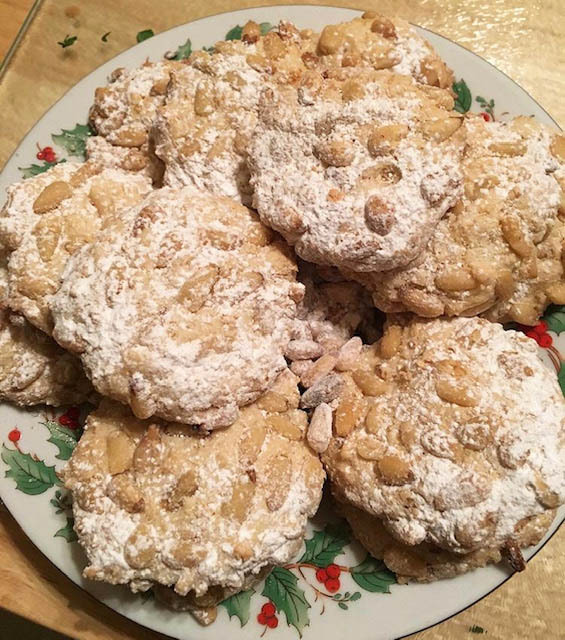 The dessert table can be as basic or elaborate as you want it to be and may include a selection of the following: strufoli; pignoli cookies; panettone; cannoli; sfogliatelle; lobster tails (the pastry); tiramisu; torta della nonna; biscotti; pizzelle; and torrone. My favorite pasticcerias are Court Pastry in Cobble Hill, Pasticceria Monteleone in Carroll Gardens, and Gino’s Pastry Shop in the fabled Belmont section of the Bronx. Raw fennel (finnoch’) is usually set on the table in between dinner and dessert to cleanse the palate along with mixed nuts in the shell. Serve with espresso (called demitasse by my family) and various digestivi, such as anisette, sambuca, amaretto, limoncello, grappa, amaro, and that bottle of Galliano that’s been collecting dust in the back of your liquor cabinet since 1978. 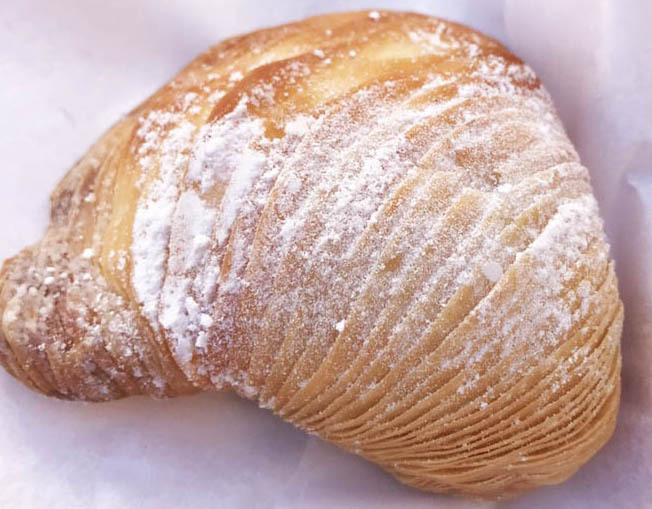 Unlike in Italy, Italian-Americans tend to have their coffee with dessert rather than after. Corretto “corrected”—with a shot of sambuca or anisette— is popular in both Italy and the States. Then, off to midnight mass—or, more likely, bed. Tomorrow is another day.